Apparently it's a thing in Germany that dudes are supposed to sit when they use the toilet, for all activities that one would do on a toilet. As far as I know for how things are done in the US (without being a dude myself), I understand that American dudes (tend to) stand up when they are urinating. 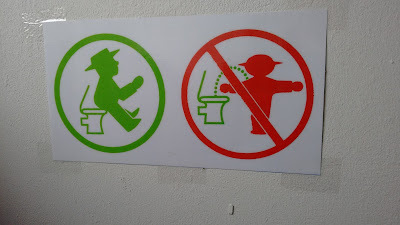 Take this as a warning, American guys: the Ampelmann wants YOU to sit down at all times when using the toilet. I saw this jaunty little sign in the (unisex) bathroom of a thrift store in Kaiserslautern. Looks like a highjacking to me, at least of the green guy. Is it just me, or does he look like he's praying? 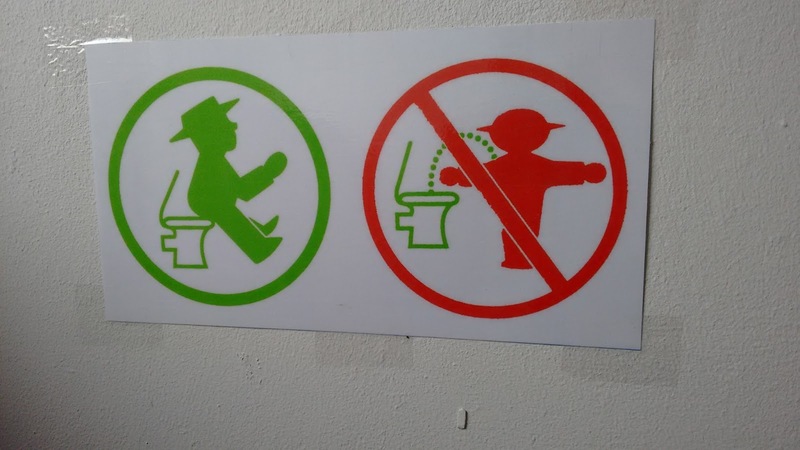 I really hope American men don't pee like the red guy here - "Look ma, no hands!" Apparently American men find it an affront to their masculinity to be expected to sit while peeing (unless there's a urinal to use). My German husband says they should take one of those forensic lights to the walls near their toilets and then be responsible for cleaning the area themselves. 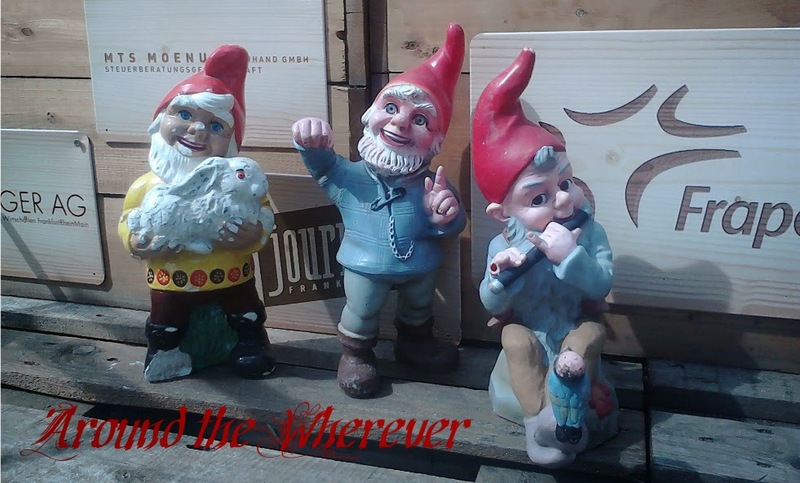 The funny thing about the red guy is that he's really standing quite far away! That certainly doesn't help with splatter either! I recently stayed somewhere that had a picture of the same rule that was disturbingly realistic for a stick type drawing. The drawing included the piece of anatomy! The "no" version of the photo showed said anatomy just hanging out and relieving itself whereas the "yes" version of the photo showed the user sitting with EVERYTHING tucked neatly into the toilet bowl. I was both amused and horrified. It made me wonder: would men need such explicit (hehe, intended for both meanings) instructions of how exactly one properly sits on a toilet and where everything must be aligned? Unfortunately I didn't take a picture of that one. The green guy kind of looks as if he is bending down to work in the garden to hoe something, I think. Or, I think that someone with intermediate to advanced Photoshop skills removed a walking Ampelmann's legs, then reattached them at a different angle. Look at the toilet, too. I am suspicious about its origins as well. It looks somewhat like a fire hydrant with a toilet lid drawn on. I would love to know the answers to these questions. ...and since I'm a bit of a naughty person sometimes: the more I look at the green Ampelmann, I'm wondering if he would make a mess too. Look how far forward he's sitting! Oh, goodness, I can't believe that we're talking about Ampelmannpinkler. Yep, Ampelmannsitzpinkler. That's what we get to talk about over here! I've seen that graphic depiction of toilet instructions, too. I think most Americans wouldn't be able to handle the stick man's johnson, but it seems quite German, doesn't it? Clear, to-the-point, leaving little room for confusion... And who knows? Perhaps it's helpful for men from cultures where squat toilets (or holes in the ground) are more common. "Yes, you sit, but also point your willy into the bowl." And now I'm sitting here wondering if I'm actually going to hit "publish". First of all: I'm glad you hit "publish." That was totally hilarious, and so right! Indeed, Germans are very clear about their expectations and communication (I very much appreciate that about them). The other really funny thing about the sign I don't have a picture of, that I hadn't mentioned before, was that the "no" guy was super casual and had his hat on backwards. The designers wanted to be really clear that everything about him was a resounding "no." The good guy version had him sitting very neatly on the toilet, all appendages tucked in where they belong, and his hat facing forward. Also: my friends and I in real life end up about talking about horrible things in real life! One woman is very excited about her studies in waste water...and we've found ourselves discussing this at dinner. Another friend wanted to know the English word for "durchfall" and I'm not talking about failing a test! Sheesh. It makes sense that they'd want guys to sit down in a unisex bathroom, although it would probably be mind boggling to many in the US that unisex bathrooms are even a thing over here. It was one of those bathrooms where it's one stall and the user can lock the door, if that makes more sense. There wouldn't be more than one person in there at a time. Ah I see. I've been in ones that were unisex but with multiple stalls so there were men and women in line at the same time. In any case, if there's no urinal, I can see why they'd want them to sit (although I have been in a unisex one in Switzerland that had urinals in addition to the stalls).